Horace j. Edwards and the Time Keepers traces Horace’s adventures through all of 6th grade, each book set in a new season, a new time in history, and a new city that needs to be saved. The series touches on the deeply human themes of loss, friendship, and renewal. It is a reminder that the things we have discarded in our lives – buildings, cities, ideas, and even people – are sometimes the most valuable. Horace Edwards is an ordinary boy who’s just moved to Niles, Michigan. That is, until the start of 6th grade when he not only learns of the mysterious death of his grandfather, but also becomes the recipient of a strange inheritance. In his efforts to uncover the truth about his grandfather’s death and the secrets of his new inheritance, Horace finds himself transported back in time to the Ancient Egyptian city of Amarna. There he meets the future pharaoh, King Tut, and together these two boys become engaged in a dramatic fight to save the city from total destruction. In the process Horace discovers that he is the heir to an order of guardians, known as the Time Keepers. With help from two friends and a bully, Horace and Tut attempt to save the ancient city, stop the sale of Horace’s family farm, and protect a secret that lies at the very heart of Egypt’s existence, the magical power of the Benben Stone. However, their task won’t be easy. Tut’s uncle Smenk, is trying to erase the memory of Tut’s father from the pages of history and Tut with him. There is only one small problem with Smenk’s plan; he needs Horace’s magical scarab beetle to do it. 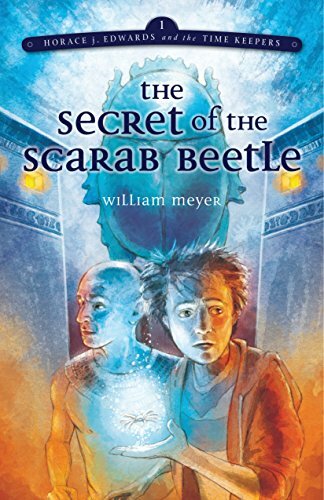 In The Search for the Lost Prophecy, the sequel to The Secret of the Scarab Beetle, Horace continues to search for more information about the Time Keepers and his role in this secret order. After he discovers that the tree portal at his grandparents' farm is destroyed, Horace, along with his friends Anna and Milton, travels back in time to 1920s Detroit, hoping to learn more. There they meet keeper Herman at the Scarab Club and learn that someone is threatening the Time Keepers and the order's mission. Horace finds out that the mystical Benben Stone is being stored in a crypt back in present-day Niles, Michigan. And Horace is now tasked with keeping the sacred stone safe. Will the person or persons threatening the Order learn of Horace's true identity?